Forrest Kerr Hydroelectric Project, operated by AltaGas, began operations in July 2014. Image: courtesy of BV Electric. The run-of-river power plant is installed with nine horizontal Francis turbine-generating units supplied by Andritz Hydro. Image: courtesy of BV Electric. Construction of the plant began in July 2010 on the Iskut River in British Columbia, Canada. Image: courtesy of BV Electric. River water is diverted through a 7m high overflow weir with two gates. Image: courtesy of BV Electric. BV Electric was the main electrical contractor responsible for the powerhouse, switchyard and intake installations. Image: courtesy of BV Electric. Forrest Kerr is a 195MW run-of-river hydroelectric project located on the Iskut River in British Columbia, approximately 1,000km north-west of Vancouver, Canada. The plant is owned and operated by Canadian energy company AltaGas. Construction of the power plant began in July 2010 and was completed at a cost of $725m in June 2014. AltaGas signed a 60-year power purchase agreement with BC Hydro in March 2010 to supply the generated electricity to the utility’s power grid. The hydroelectric power project created 400 jobs during the peak of construction. It is capable of generating enough electricity to power approximately 70,000 homes in British Columbia and will offset more than 450,000t of greenhouse gases annually. The project is also expected to help meet Canada’s target to reduce its greenhouse emissions to 607 million tonnes (Mt) in 2020 and contribute to British Columbia’s goal to achieve energy self-sufficiency by 2016. 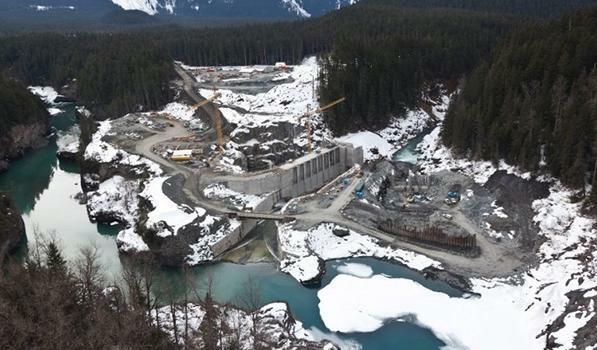 A dam and hydroelectric generating station being developed in British Columbia, Canada, with a potential annual generating capacity of 5,100GWh. Originally developed by Coast Mountain Hydro, the Forrest Kerr project received a Provincial Environmental Assessment Certificate in 2003. The project was sold to NovaGold in 2006 after Coast Mountain Hydro was unable to obtain funding. AltaGas acquired the project in 2008 when it bought Coast Mountain Hydro from NovaGold. Forrest Kerr is located within the Tahltan First Nation traditional territory. AltaGas/Coast entered into an Impact Benefit Agreement (IBA) for the project with the Tahltan Central Council in May 2010. The hydroelectric facility successfully completed the 72-hour testing period required to achieve the commercial operation date (COD) in October 2014 and delivered the certificate of COD to BC Hydro. "Approximately 250m³ of water is diverted per second through two 10m-wide Obermeyer gates." The power plant consists of a diversion weir, intake structure, desanding facility, power tunnel, underground powerhouse, tailrace tunnel, and an associated electrical substation and transmission works. Unlike regular hydroelectric projects that impound water within a dam, the Forrest Kerr plant redirects a part of the river water to an intake structure situated close to the meeting point of Forrest Kerr Creek and Iskut River. This process leaves behind smaller environmental footprint and minimises the impact on terrestrial and aquatic ecosystems. Approximately 250m³ of water is diverted per second through two 10m-wide Obermeyer gates of the 7m-high overflow weir into the intake structure. The water then flows into a 3.3km-long power tunnel through a 7.5m-wide and 11m-high vertical intake gate. The tunnel opens into an underground powerhouse containing the turbines and generators. Turbines capture the immense energy of the water generated by the natural flow and elevation drop of the Iskut River to produce clean electricity. A tailrace tunnel returns the water to the river downstream of the powerhouse. The underground powerhouse is 144m-long, 27m-tall and 17m-wide and contains nine horizontal Francis turbine-generating units with a capacity of 22MW each. The turbines are connected to 26.1MVA generators. The electricity generated in the underground powerhouse is transmitted to BC Hydro’s substation at Bob Quinn Lake via a new 40km, 287kV transmission line built by AltaGas. The line feeds electricity into the newly constructed Northwest transmission line at the substation. "BV Electric managed the installation of all electrical systems associated with the plant’s powerhouse, high-voltage switchyard, intake structure, and construction camp." Tahltan Nation Development Corporation provided civil support and site preparation assistance for the project. BV Electric, the main electrical contractor, managed the installation of all electrical systems associated with the plant’s powerhouse, high-voltage switchyard, intake structure, as well as the construction camp. Procon Mining and Tahltan Nation Development Corporation were responsible for the tunnel construction, underground powerhouse excavation and execution of all the underground rock works. Hatch Engineering executed the final design and procurement of materials, equipment and labour for the construction. Andritz Hydro supplied the turbines and generators, while Turbine PROs was responsible for the installation. The construction of the cofferdam, miscellaneous foundations, structural steel erection and three bridges associated with the hydroelectric project were undertaken by Formula Contractors. Westpro was responsible for the forming, placement and finishing of all concrete structures, as well as aggregate production and site batching of approximately 35,000m³ of the concrete. Northwest Hydraulics designed and conducted the computer and physical modelling of the intake and desanding facility. It also conducted hydrology and geomorphology assessments to assist with the environmental permitting efforts. Environmental monitoring, permitting compliance and construction monitoring were performed by Ecofish Research and Ecodynamic Solutions. Valard Construction built the 40km line connecting Forrest Kerr to the Northwest tranmission line at the Bob Quinn substation.